The month of May is filled with special days and events: It's a time to get physically fit and compete in the National Spelling Bee. May is also when we honor special people: mothers, teachers, and the men and women who have fought for our country! Education World editors have culled the archives for relevant lesson plans, resources, and articles. Click on a category, or browse the resources to find lessons and articles to help you celebrate May Days! May is National Physical Fitness and Sports Month, but kids need physical education all year! Education World's Physical Fitness page offers a full roster of stories, lessons, resources, and activities focused on PE! Education World's "Principal Files" principals share some things they have done to show their appreciation. Included: Some of these 65 ways are sure to work for you. This Teacher Appreciation Week, in recognition of all that you do, Education World provides five lessons to leave behind for your class and your substitute to enjoy. Are you looking for the very best ways to show your teachers just how important they are? Education World asked teachers around the country about their favorite Teacher Appreciation Week celebrations. See more fun ideas in our special Mother's Day Archive. Teachers who've joined The Read In! share their favorite reading activity ideas. Included: Theme ideas for reading fun. uthors' Web pages teem with biographical information, bibliographies, information about specific books, and even, in many cases, activities geared to fun and learning. Learn how to transform a school author or illustrator visit from an hour of entertainment into a life-long connection to reading and writing. Education World offers ten lessons to spark students' curiosity about the wonderful world of books. The folks at the BOOK-IT! Program have given Education World permission to reprint 25 great ideas from teachers -- ideas that are sure to get kids across the grades excited about reading. Students who read and write more at home do better on tests of reading and writing ability. Included: Activities to get students reading and writing at home. 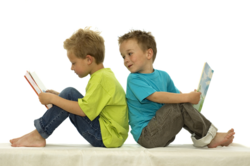 "Simple Things You Can Do to Help All Children Read Well ..."
Simple Things You Can Do to Help All Children Read Well and Independently by the End of Third Grade is a booklet from the U.S. Department of Education. See more reading lesson ideas in our Reading Archive. Five original lessons help you incorporate spelling into your entire curriculum. Plus more than a dozen additional spelling resources. This easy way to review spelling words in a kickball game format is perfect for those days when students need to get up and MOVE. Part of a writing lesson, this Ed World lesson includes a work sheet on which students correct spelling and grammar errors. See more spelling lesson ideas in our Spelling Archive. Introduce students to the true meaning of the holiday, and provide them with a glimpse into the lives of the men and women it honors. Included: An Internet Treasure Hunt plus Web-based activities for learning about and celebrating Memorial Day. Education World's holiday page provides crafts, recipes, games, and other resources about Memorial Day. See more ideas for celebrating this special day in our Memorial Day Archive.